Super Bowl XLIX is February 1st, and we all know what that means – Super Bowl parties! You’re going to have a full house of fans having a blast; some might be regulars and others might be first-timers, so how do you get them coming back the other 364 days of the year? That’s where we come in. Along with the nachos and pretzels, don’t forget to put TapSnap on your Super Bowl party checklist. TapSnap is a modern twist on the photo booth that allows you to completely customize your photos. Add your favorite team’s logo, digital props of your favorite players, or green screen backgrounds of University of Phoenix Stadium to your photos to place your guests in the middle of the Super Bowl action. Your guests will leave not just having enjoyed the excitement of the game, but having also created great themed photos to share online or print to take home. TapSnap will take your Super Bowl party and convert it in to far-reaching marketing capital. Just like a Super Bowl commercial boosts the awareness of a company, we’ll put your brand front and center. Don’t just show your guests a good time, show everyone! Your happy customers will tweet, like, share, and comment on the branded photos they take with TapSnap. You’re now engaging your customers’ social networks to help you keep the conversation going long after the big day. TapSnap doesn’t only improve your social media presence; we’ll also enhance your email marketing campaigns and loyalty programs by collecting valuable marketing data. So you can stay in touch with your customers year round and keep them up to date on what’s happening. As you can see, TapSnap is an all-in-one marketing machine that just happens to be crowd-pleasing fun. 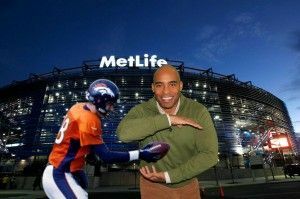 Check out our album featuring Tiki Barber at one of our Super Bowl parties from last year! To book us for your upcoming event or to simply learn more, visit us at info@tapsnap.net or call 877.577.0566.